Sail across famous pyramids and temples on your mystical winged scarab. 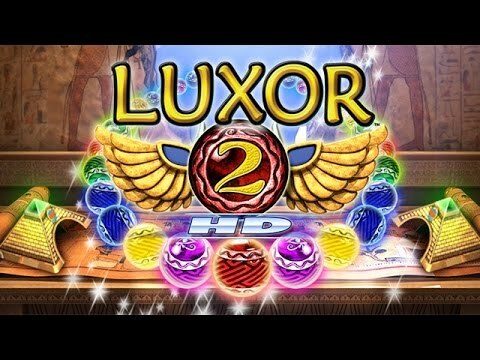 "Luxor 2 is a much better game than any of the other Luxor games. It provides variety and gets harder--requiring more skill--as it moves from start to finish. I find it hard to get through the "easiest" level and have not mastered level 2 at all. It is exciting. My wife and I play it on separate computers all the time." Embark on a beautiful voyage across the dazzling landscapes of ancient Egypt as you play your way through 88 gorgeously rendered levels in brilliant, widescreen HD. Use your mystical winged scarab to shoot and destroy the approaching magical spheres before they reach the pyramids at the end of their path. And to help you shoot down those enemy spheres, Luxor 2 HD features more explosive power-ups than ever before. Match endlessly-shifting chains and defeat the monstrous creatures. Enjoy this arcade puzzler that takes you on a thrilling adventure across the lands of ancient Egypt. Answer the call of the goddess as you wield the mystical winged-shooter. Follow John Swift and Jane Graham as they travel through the past to keep history intact. Wield your winged-scarab shooter before the advancing chain destroys the pyramids.